China to launch manned space mission Shenzhou 11. 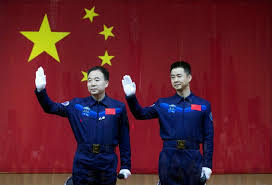 Two taikonauts will set off to dock with Tiangong 2 space laboratory as part of bid to create permanent presence in orbit. China will launch a two-man space mission, Shenzhou 11, on Monday, the state-owned Xinhua news agency said, taking the country closer to its ambition of setting up a permanent manned space station by 2022. After Monday’s launch at 7.30am (11.30pm GMT), the taikonauts will dock with the Tiangong 2 space laboratory, where they will spend about a month, testing systems and processes for space stays and refuelling, and doing scientific experiments. China launched Tiangong 2, its second experimental space lab, last month. China says its space program is for peaceful purposes, but the US Defense Department has highlighted its increasing capabilities, saying it was pursuing activities aimed to prevent adversaries from using space-based assets in a crisis.